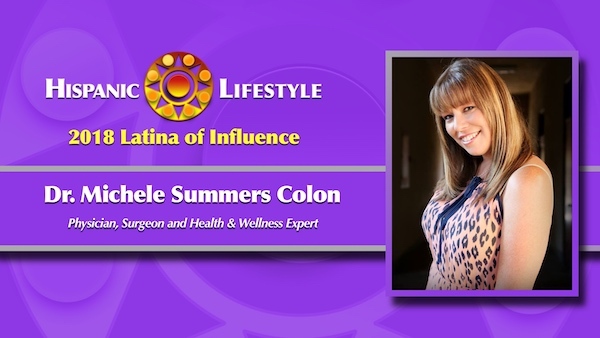 Hispanic Lifestyle is pleased to recognize physician, surgeon, health coach, yoga teacher, anatomy instructor, author, podcaster and overall health & wellness expert Dr. Michele Summers Colon as a 2018 Latina of Influence. Ms. Summers Colon along with our entire list of 2018 Latinas of Influence are invited to participate in Hispanic Lifestyle’s 2018 Latina Conference taking place April 4 and 5, 2018 in Ontario, California. Dr. Michele Summers Colon as a physician, surgeon, health coach, yoga teacher, anatomy instructor, author, podcaster and overall health & wellness expert, Dr. Michele Summers Colon’s passion is helping women with diabetes and autoimmune disease heal their body. She has been interviewed and quoted in many prominent publications including USA Today, US News & World Reports, Health Magazine, Yahoo! Makers, and Bloomberg BusinessWeek. One of Dr. Michele’s greatest strengths is her ability to help women create balanced, healthy lives by looking at the whole picture. Shee combines the best of Eastern and Western medicine to create individualized health & wellness plans for her patients and clients. For over 22 years, Dr. Michele has dedicated herself to maintaining a private medical practice and providing exceptional care to her patients while at the same time studying holisitic and integrative medicine. Dr. Michele believes that food is medicine and that yoga, Ayurveda, and meditation are the keys to perfect health. Dr. Michele has a Bachelor’s degree in Physiology from UCBerkeley, a Master’s degree in Biomedical Sciences and a Doctorate degree in Podiatry from Barry University, and graduated from a Foot & Ankle Surgical Residency in Los Angeles. Dr. Michele is also certified in Health Coaching, Yoga, Reiki, Reflexology, and Laser Therapy. Dr. Michele specializes in Yin Yoga, Restorative Yoga, and Therapeutic Yoga to provide the most healing, relaxation, and rejuvenation to her patients and clients. Dr. Michele has studied Ayurvedic Medicine extensively and has worked with some of the best practitioners throughout California to bring Ayurveda to the forefront of medicine. Combining yoga, Ayurveda, and meditation is one of Dr. Michele’s passions so that she can spread the word to as many clients and patients as possible that this is the path to perfect health. Michele is the epitome of a Latina of Influence. She is devoted to the care of her patients, clients and members of the community. In addition to her work in health and wellness, and her research in diabetes and autoimmune illnesses, she orchestrates charitable activities and events, in which friends and colleagues come together to donate necessities to homeless women and children.